Windows 10, expected to ship sometime this year (Microsoft’s not offering more details on timing), features much-needed user interface improvements, security enhancements in identity protection and access control, and a unified code base and APIs to allow developers to build apps that will run on multiple devices. These are all welcomed improvements given that many enterprises were slow to (or simply didn't) upgrade to Window 8. "Security and manageability are always compelling, and the return of the Start menu and a cleaner split between desktop and tablet modes removes a major adoption barrier that enterprises had for Windows 8 and 8.1," said Forrester analyst David Johnson. CIOs have reason to be cautiously optimistic about moving users to the next iteration of Windows. But how and when should they make the move? 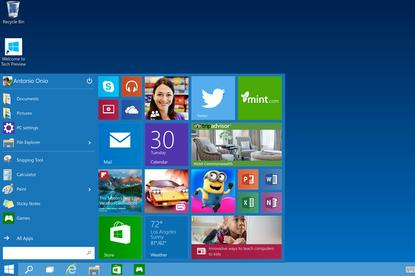 Below are five things IT leaders need to know about the next Windows. Since launching the ambitious but flawed Windows 8 in 2012, Microsoft has been in a perennial state of damage control. In a failed attempt to make Windows better for touch devices, Microsoft botched the user interface and left legions of disappointed customers. CIOs were particularly repelled by Windows 8 and its radically different, touch screen-optimised UI, as well as by its alternate traditional desktop interface, which was included for running legacy Windows apps but lacked key familiar features, namely the Start button and Start menu. The toggling between the two modes was also clunky. "History shows that Microsoft over-rotated on touch, and distanced itself from traditional PC users that need, at least some of the time, a good keyboard-and-mouse experience," said Al Gillen, an IDC analyst. "The focus in Windows 10 is to re-balance the experiences such that commercial customers will see value in Windows 10 that they did not see in Windows 8." Microsoft tried with partial success to address these and other issues in subsequent Windows 8 revisions and updates. But most CIOs clung instead to the solid, stable Windows 7, unwilling to subject their end users to a long, unpleasant and productivity-eroding learning curve. One of the many companies that skipped Windows 8 was US-based health club chain L.A. Fitness. "It was too much of a change from what people are used to and we didn't want to go through the challenges of getting people comfortable with it and the time necessary to do so," CIO George Bedar said. With Windows 10, Microsoft tackled head on the UI issues, and judging by publicly available preview versions of the OS, it apparently has finally gotten it right. The traditional desktop UI looks and acts a lot more like Windows 7, and the touch-optimised UI is more intuitive. Also, the interplay between the two has been greatly enhanced -- Windows 10 is "adaptive," meaning it can detect which device is being used (desktop, laptop, tablet, large wall mounted monitor, smartphone) and adjust its rendering. Microsoft has also pledged that upgrading from Windows 7 and Windows 8 to Windows 10 will much more seamless and straightforward. Microsoft is touting improvements in areas like identity protection and access control, information protection and threat resistance. For example, in access control, Windows 10 will have native two-factor authentication, as Microsoft tries to get users beyond the single-password method that has proven so vulnerable. With two-factor authentication, malicious hackers need to be in control of two pieces of information in order to break into a system, such as a password and a code sent to a user's device like a smartphone. In the area of information protection, Windows 10 will have a data loss prevention (DLP) technology baked in that distinguishes between personal and corporate data, and protects the latter using "containment." Corporate apps, data, email, web content and other sensitive information will be automatically encrypted by Windows 10 both on desktops and mobile devices. In the area of threat and malware resistance, Windows 10 will have features to lock down devices and only allow users to run apps that have been signed using a Microsoft provided signing service.